Some of our students live relatively close to Ennis, and choose to drive their own vehicle. Many others choose to fly in Bozeman Yellowstone International Airport, a 1-hour drive from Ennis. 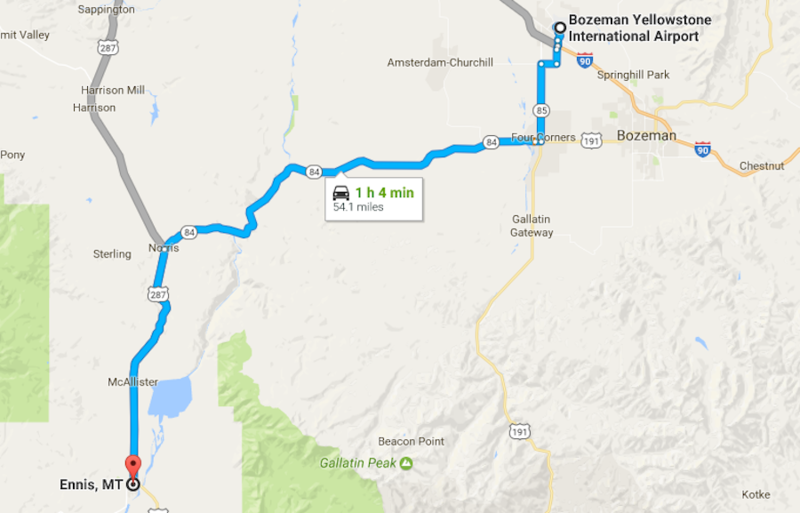 Check out the Bozeman Yellowstone International Airport website for more information on airlines and air travel to and from Bozeman. We suggest renting a car in Bozeman, however we can arrange airport pick up if desired. You can also get an airport shuttle to Ennis. Check out Buffalo Shuttle for more information. Our first recommendation is El Western Cabins and Lodges across the river from downtown Ennis. This is the meeting location on the first evening, and provides a little bit of everything to fit our students’ needs. There are also a few other motels in town if availability at El Western is limited. VRBO is very popular in the Madison Valley. The advantage of renting a house is privacy, a full kitchen and likely a spectacular view, best enjoyed in the evening or early morning. Check out VRBO.COM for more information. Read more about lodging in Ennis, Montana.